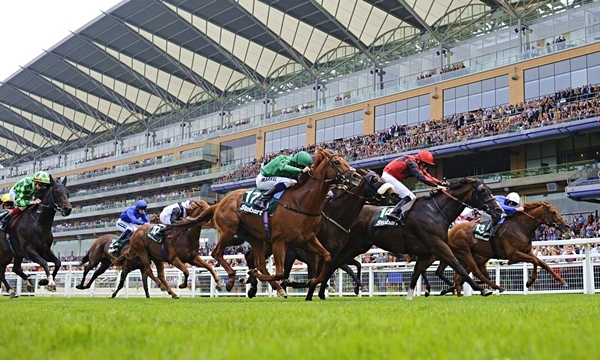 Ascot stages a seven-race card on a busy Friday afternoon with top quality action also taking place at Newmarket and York. The action begins at 1.55 with a two-year-old maiden over six furlongs. Richard Hannon saddles two runners here with Nisser and Madrinho. Both showed promise on their debut with Nisser finishing third to Shalaa at Newmarket and Madrinho fourth to Twin Sails at Newbury. Stormy Antarctic and Race Day can also be expected to improve for their debut efforts but preference is for Nisser. The form of the Newmarket race received a massive boost with the winner taking the July Stakes on Thursday. The Nursery at 2.30 looks wide open with the weights headed by Charlie Appleby’s Rouleau. He finished fourth to Show Me Again on his debut at Nottingham last month, running on nicely after missing the break. He followed up by landing the odds at Wolverhampton in a minor contest but faces a difficult task in conceding 8lbs to his Nottingham conqueror. Timmy Murphy partners Show Me Again who is our betting tip at around 9-2. Steve Rogers is at tough as old boots and keeps defying the handicapper. He has won four of his last five races, his only defeat coming over an extended two miles at York in May. He bounced straight back to defeat Viking Storm at Sandown and has been raised a further 5lbs here. The main danger could be All Talk N No Do, a winner at Doncaster last month. The 4.45 is an intriguing one-mile handicap for three-year-olds with a field of just six runners. Dutch Law won well for this column at Newmarket last time out. Hughie Morrison’s gelding got off the mark in good style and is up 6lbs here. He may just struggle to cope with the lightly-raced Rifle Range, trained by Roger Varian. He was runner-up at Chelmsford City on his debut before beating Memorial Bay by two and a quarter lengths at Haydock last month. Graham Lee partners the gelding who does not look harshly treated off a mark of 86. Simon Crisford is enjoying his first season as a trainer and he could strike in the last with Mutawathea. The four-year-old has won two of his last three races at Kempton Park and carries a 6lbs penalty. Aaron Jones claims 5lbs off the top weight and he could prove difficult to beat.